Shown here is the phenomenon, "solvent cavitation under solvo-phobic confinement," which PNNL researchers saw occur with carbon-rich nanorods they mistakenly created. 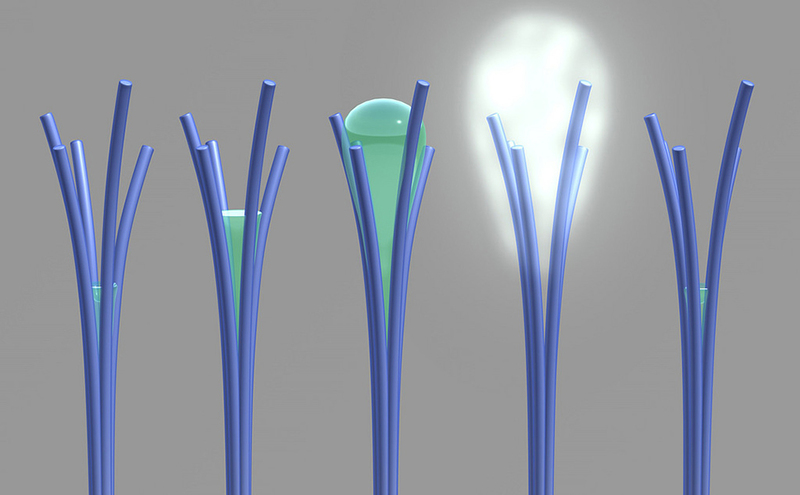 PNNL's viewing of the phenomenon involved liquid spontaneously evaporating after being confined within tiny spaces in between touching nanorods. Image from S. Nune et al, Nature Nanotechnology, 2016. Enlarge Image. After their nanorods were accidentally created when an experiment didn't go as planned, the researchers gave the microscopic, unplanned spawns of science a closer look. Chemist Dr. Satish Nune was inspecting the solid, carbon-rich nanorods with a vapor analysis instrument when he noticed the nanorods mysteriously lost weight as humidity increased. Thinking the instrument had malfunctioned, Nune and his colleagues moved on to another tool, a high-powered microscope. They jumped as they saw an unknown fluid unexpectedly appear between bunches of the tiny sticks and ooze out. Video recorded under the microscope is shaky at the beginning, as they quickly moved the view finder to capture the surprising event again. The team at DOE's Pacific Northwest National Laboratory would go on to view the same phenomenon more than a dozen times. Immediately after expelling the fluid, the nanorods' weight decreased by about half, causing the researchers to scratch their heads even harder. A paper published in Nature Nanotechnology describes the physical processes behind this spectacle, which turned out to be the first experimental viewing of a phenomenon theorized 20-some years ago. Why It Matters: The discovery could lead to a large range of real-world applications, including low-energy water harvesting and purification for the developing world, and fabric that automatically pulls sweat away from the body and releases it as a vapor. "Our unusual material behaves a bit like a sponge; it wrings itself out halfway before it's fully saturated with water," explained PNNL post-doctoral research associate Dr. David Lao, who manufactured the material. "Now that we've gotten over the initial shock of this unforeseen behavior, we're imagining the many ways it could be harnessed to improve the quality of our lives," said PNNL engineer Dr. David Heldebrant, one of the paper's two corresponding authors. "But before we can put these nanorods to good use, we need to be able to control and perfect their size and shape," added Nune, the paper's other corresponding author. Methods: Ordinarily, materials take on more water as the humidity around them increases. But these carbon-rich nanorods - which the researchers mistakenly created while trying to fabricate magnetic nanowires - suddenly expelled a large amount of water as the relative humidity inside the specimen holder reached anywhere between 50 and 80 percent. Water expulsion can clearly be seen in the microscope video. Water is visible as a gray, cloudy haze - and only emerges from where nanorods intersect. When the team went on to raise the humidity further, the nanorods' weight also increased, indicating they were taking on water again. It was also reversible, with water being ejected and later absorbed as humidity was gradually lowered back down. The team was further intrigued. They couldn't think of any other material that takes on water at a low humidity and spontaneously releases it at a high humidity. So they dug through the canons of scientific literature to find an explanation. They found a 2012 paper in the Journal of Physical Chemistry B that explained how, in certain situations where liquid is confined in a teeny-tiny space (roughly 1.5 nanometers wide), the liquid can spontaneously evaporate. And the authors of a 2013 paper in the Journal of Chemical Physics described how water can condense into the confines of close hydrophobic materials, which do not play well with water, and quickly turn into vapor due to attractive forces between the surfaces of the two materials facing each other. The 2013 paper gave this phenomenon a very long, technical name: "solvent cavitation under solvo-phobic confinement." These papers also noted the process was theorized as early as the 1990s by scientists examining crystallized proteins. Back then, scientists noticed they only saw water vapor surrounding hydrophobic sections of protein, while liquid water would surround other areas. The researchers proposed that there was some sort of process that enabled the water caught between hydrophobic protein sections to suddenly vaporize. Armed with this knowledge, the PNNL team hypothesized water was condensing and forming a bridge between the nanorods, through a process known as capillary condensation. Next, they believe water between rods forms a curved cavity whose surface tension pulls the adjacent rods closer together. When two intersecting nanorods reach about 1.5 nanometers apart, the team reasoned, the water caught between them could be forced to quickly evaporate. What's Next? Though understanding the nanorods' unexpected behavior is a triumph in itself, the PNNL team also foresees a future where this phenomenon could also improve quality of life. They see their discovery as a potential humanitarian lifesaver, describing it as "a paradigm shift in water purification and separation" in their paper. Theoretically, large quantities of the water-spitting nanomaterial could repeatedly take on and then eject collected water when a certain humidity level is reached. Such a system could be used in remote deserts, where it would collect water from the air and harvest it for human consumption. Another vision is to create a membrane that takes on and later expels water as humidity changes. The membrane could be used in jacket fabrics and enable more comfortable outdoor adventures by removing sweat from inside a jacket and emitting it outside as a vapor. To make these applications possible, the team is exploring ways to make more of its nanorods spray water. The team estimates only around 10 to 20 percent of the material spits water right now. The plan is to scale up production of the current material, creating more than a few grams of the material at a time. They will do further analysis to ensure the phenomenon is still present when more nanorods are present. They are also conducting a more detailed examination of the material's physical and chemical properties and determining if other materials that have similar properties. And the team is intrigued by the idea that different nanomaterials could potentially be developed to collect other liquids, such as methanol. Sponsors: Materials Synthesis and Simulation Across Scales Initiative at PNNL. User Facilities: The project also used the expertise of staff and several advanced instruments -- environmental transmission and scanning electron microscopes, an X-ray photoelectron spectrometer and a Mössbauer spectrometer -- at EMSL, the Environmental Molecular Sciences Laboratory, a DOE Office of Science User Facility at PNNL.